For all of you tool men (and ladies) out there one can never have too many tools and handy gadgets! From drills to hammers there are a plethora of tools at your fingertips, no matter what kind of project you’re working on. And this is I come in – I am going to review the top mini table saw of 2018; whether you’re working on building a treehouse for your kids or just working on some projects around the house, I’m sure you’ll find whatever it is that you’re looking for, let’s get started! 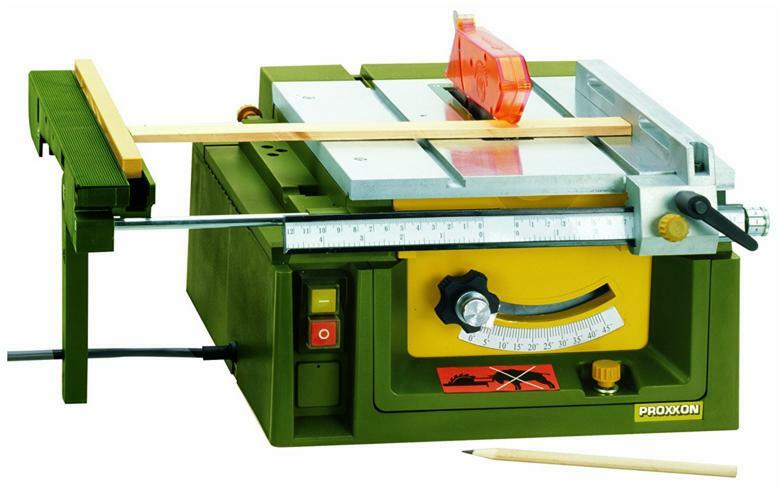 The Proxxon 37070 is one of the more expensive table saws on the market, costing about $435.00 on Amazonand is ideal for fine mechanics, model building, and any kind of mold construction, toy manufacture, architects, model carpenters, fitters, and whoever else that may be in the need for an efficient table saw. This particular saw is also the perfect choice if you are looking for a saw for cutting wood, non-ferrous metals, plastics, plexiglass, glass fiber reinforced sheets, foam and many other materials, making the Proxxon incredibly versatile. The Proxxon is has both a durable and stable construction because of the load bearing parts and plane milled table that are made from die cast aluminum with an adjustable limit stop for manufacturing parts of equal length and angles. Additional features of the Proxxon include an extendable table extension with an integrated auxiliary stop. The motor that comes with this saw is incredibly powerful which is a plus if you have some tough material that you’re working with. Although it advertises “precision” cuts, some of the cuts tend to come out rather ragged and uneven; also, the motor housing hits the bottom of the table bed, keeping the blade from tilting to its full 45 degrees (the farthest it would go is 42 degrees) which is a bummer considering it’s rather on the pricey side. Keep in mind that this saw works a bit better with smaller pieces of wood than larger. 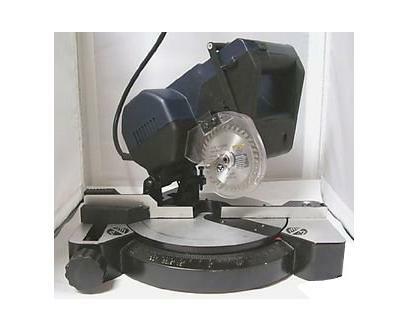 The TruePower 919 is certainly more reasonable, price wise, than the Proxxon, only costing you about 40 bucks on Amazon; the TruePower 919 includes a 2″ blade and table clamp, which are included to make sure that the cutting process is made easy, efficient and effective as best as possible. This particular saw also comes with a 7800RPM motor which ensures that the blade is strong enough to cut any material subject to it without difficulty so this is a major bonus. This blade is certainly durable enough to cut through the toughest of materials with little trouble. This is not the saw for you if you plan on cutting a ton of material- it genuinely isn’t made for that, but it is perfect for smaller jobs. It’s also amazing for cutting lightweight metals and stained glass projects, and you the price is certainly reasonable as well. The saw does whine a bit if it gets too stressed, so be mindful of that; with that being said, if you are looking to do some major projects, you may be better off paying the extra dollars and getting something else. This baby right here will set you back roughly $100.00 on Amazon, with some of the major features being that it is incredibly easy to set up and get going, this particular table saw is not complicated at all; it also includes a vacuum port, a miter gauge and a 55-piece starter blade set, which is pretty amazing for those who are just starting out in the world of tools. The Rockwell is very portable and the “hold-down” guard and splitter cuts will undoubtedly cut wider material, with a larger rip fence that allows for better control and a nice, accurate cut for your projects. There are also instant, tool-free blade changes, providing you the option to change the blade in as little as three seconds and is compatible with any four inch T-shank jigsaw blades. Depending on the thickness of the material you are looking to cut, this saw may cause you a bit of trouble. 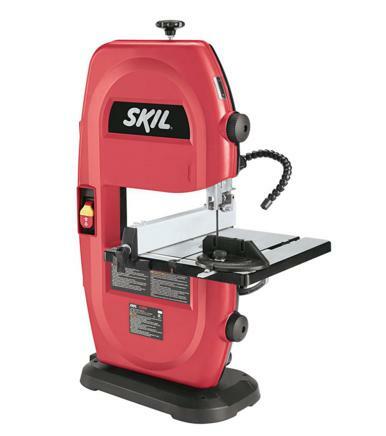 The SKIL 3386 features a particular design known as a rip fence that allows for straight and accurate cuts; the 6-TPI band saw blade cuts through a variety of wood materials, with an articulating LED work light for a better view of your work piece and cut-line (because no one likes uneven and jagged cuts). The SKIL 3386 alsofeatures a 1-1/2-inch dust port that keeps your work area clear of dust, with a rack and pinion table adjustment for quick angle change and height adjustments. The motor is 1-speed for wood or metal based materials, just as an FYI. The price is fairly reasonable ($130.00 on Amazon) additional pluses include the portability of it- again, it’s the perfect choice for smaller projects! You may experience a bit of reduction in power, depending on how often you use this saw- if this is the case you might want to check the drive belt, which could potentially be loose. In addition to this, the blade that comes with this particular saw is rather low quality, so if you are looking to cut through some tough material you will probably want to switch it out for a more durable blade. Let’s get straight to the point with the Gino- this will set you back less than $100 bucks on Amazon and includes some pretty nice features such as 9000 RPM, 0-45Degree L&R miter angle options; the table stops at 0 degrees, 15 degrees, 22.5 degrees, 30 degrees, and 45 degrees left and right so there is a wide variety in that aspect. The Gino also includes 3-1/8″ carbide tipped blade (36 teeth) and spanner for effective and efficient cutting. This saw is just about perfect for acrylic and wood; it is incredibly easy to use, even if you are just getting into the world of cutting! I would not suggest this particular table saw for any kind of metal; in addition to this, the replacement blades are a bit unusual in size so it may be difficult to find them when it is time to purchase new blades so that can be a headache. Do all saws come with variable speed control? All saws do not necessarily come with variable speed control, so if this is an important option for you make sure you read the information prior to purchasing. How do you change the blade for these saws? The answer to this depends on what kind of blade/saw that you are using- even so, most are fairly easy to switch out and replace. You typically have to take the cover off of the blade and unscrew a couple of screws in order to replace it. All in all, as a conclusion, you may want to keep in mind that these are mini table saws so if you are looking to tackle a big project you may want to spend the extra money and get something more powerful. After reviewing these particular saws, it is obvious that these are meant for smaller projects that will not put that much stress on the saw or its blades. 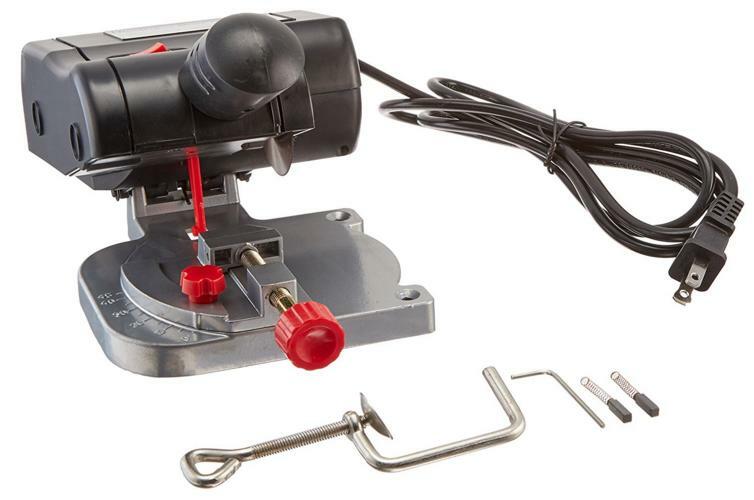 If you are working on a small project, I personally would not recommend spending a ton of money for a mini table saw so the Proxxon would be out, in my opinion. 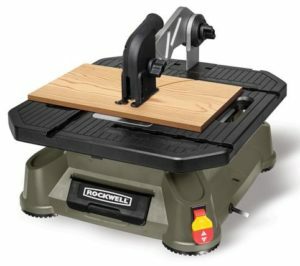 You may want to opt for the Rockwell out of the table saws that were reviewed above, just be mindful of what it is that you need exactly.